The Open Badges Project being directed by Mozilla is an interesting attempt to acknowledge a de facto environment of informal and lifelong learning (formally). I hold cautious hope that this project has legs or at least spurs more robust alternatives that can thrust informal learning front and center and give it the credit it deserves. We (as educators) have attempted for years to sing the rightful praises of informal learning and lifelong learning and great successes have been gleaned from these efforts (I stand/sit here as a product of such efforts). However, it is my belief that what it needed was an acknowledgement engine, something that demonstrates progress, learning, and expanding capacity of the individual to be both gainfully engaged (in knowledge production) and employed (people need to eat). This aspect of learning has traditionally been the domain of higher education and formal learning structures and they have done this well traditionally. However, higher education never accounted for the other 60% of our lives not in formal schooling. So we participate in any number of things. We watch a Khan Academy video. We do a few online quizzes. We learn vocabulary in another language. We take an informal course. We participate in a MOOC. We enroll in an Open Learning Initiative class. We are constantly searching for new things to learn and do, engage and expand upon. Many of us do not want or need acknowledgement for these efforts, but why not link these extra activities to an acknowledgment structure (a less rigid certification engine) that allows the individual to capitalize on initiative? More importantly, why not allow a structure where those unable to attend costly and geographically limiting higher education institutions can demonstrate progress, skilling, even cognitive development? Hence the Open Badges Project. On a side note for the learning community, you want OER materials to take off (more than they have)? You want OER and open education to become the norm? You want to incentivize the creation of these materials? Link activities to acknowledgement engines. The badge concept is nothing new (a metaphor that I am curious to see if it continues to resonate-I assume it will as we move further into the incorporation of the physical and digital) and is used with considerable success online. Kind of like wearing a university t-shirt or a bumper sticker of sorts. What is new is that this further decentralizes the process of formal recongition, potentially further removes this from national and regional accredidation agencies and their instruments in higher education and places this squarely (I should say ambiguously) outside the gated walls of academia. This, like everything else, is bad and good (for higher education). It could serve as a perfect compliment to a formal course of study at a university. It could allow for universities to offload a few of their more skill-based offerings into this realm (thinking process oriented or skill-based courses here-technical development, programming, etc.) and focus more on cognitive development and idea generation, marshalling their dwindling resources to greater effect. They could do this. “hard skills” like completing a course, mastering a specific programming language or math concept. “soft skills” like critical thinking, communication or collaboration. new skills like digital literacies. Hard skills (my mind raced here first) makes sense, as well as community aspects of collaboration (I like this idea a lot-collaboration needs to be endowed with a sense of tangible importance rather than just a proscribed social good). I like digital literacies as well as in my highly biases opinion (as someone who teaches this sort of thing often) the ability to understand information itself is, in essence, critical thinking. I like the soft skills of communication as that is critical as well. Evidence of articulate expression, a persuasive argument, a successful grant proposal, a debate. 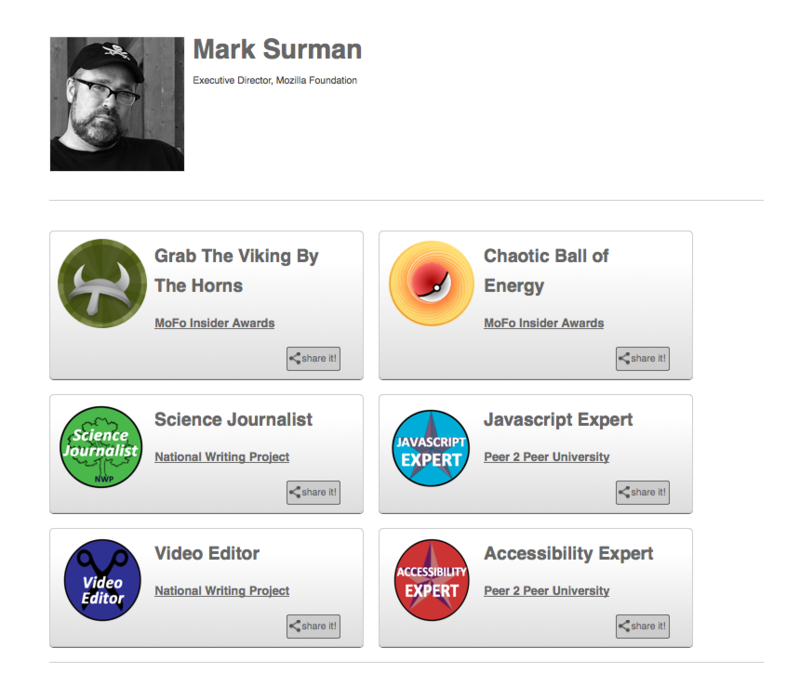 Why not badges even for university degrees? Institutionally, for those unfortunate few unable to pivot with any degree of urgency, this signals a further dissassociation with education as enabling agent for the individual, for both employability and personal success. This dissassociation is a slow, long slide of obsolescence that will cripple some, destroy some others. The progressive institutions among the mix will see this as an opportunity (as all good organizations do) and capitalize on this. I would love to see a partnership from a university (system) and the Open Badges Project. Something to give the project some exposure and perhaps some longevity. It has merit; it is capitalizing on obvious shifts in learning need and existing activity. So which brave (and progressive) institution will take the leap? And if one already has, can someone point me in their general direction so we can take a look?